This takes you to Bwindi Impenetrable National Park for mountain gorilla tracking. Bwindi National Park is located in the South Western Uganda on the edge of the western rift valley. The park is home to over 350 endangered Mountain Gorillas, which are quite possibly the most awe-inspiring animals to be found in Africa. There are also 346 species of birds and over 200 species of butterflies. Gorilla trekking is the major tourist activity in Bwindi with four groups currently available daily to tourists interested in mountain gorilla tracking. The tour groups include Mubare gorilla group (10 gorillas; 1 silverback gorilla) which was opened for tourism in 1993, Habinyanja gorilla group (18 gorillas, 2 silver back gorillas) was ready in July 1998. Rusheguru group (10 members, 1silver back gorilla) was opened in July 2002 while Nkuringo gorilla group (19 gorillas, 2 silver back gorillas) was opened for tourism in April 2004. Gorilla racking in Bwindi can be challenging so it’s best to have an average level of fitness. It starts at 8:30a.m. local time and can last from a few hours to a day depending on the movement of these giant apes. Depart from Kampala at 8:00am and head towards western Uganda for Queen Elizabeth national park located in the foothills of the Mountains of the moon. This is one of the great mountain ranges of the world in Western Uganda. As you continue to the park, you may see different animals and birds given that the park is home to roughly 100 mammals and 606 bird species. Take an early excursion to Kyambura gorge to track the fast moving and elusive chimpanzees. Though seeing these mobile chimpanzees is un predictable, the walk is wonderful given the different features of the forest. Alternatively, we visit the Maramagambo Forest where you will see the bat cave, the blue lake and several primates. In the afternoon, we take a launch cruise on the Kazinga Channel. The channel is blessed with many hippos, solitary buffaloes, and a vast array of birds. Evening game drive in the park follows. Dinner and Overnight at Mweya safari Lodge /Jacana Lodge. Full board meals. Early Start for Bwindi Impenetrable Forest, passing either via Ishasha, well known for the tree climbing lion, or through an alternative route passing through cultivated expanses. After lunch, we go for a nature walk or a community visit. Overnight at Lake Kitandara luxury tents/ Buhoma Community bandas. Full board meals. Wake up early in the morning and have an early breakfast, then proceed to the park headquarters for briefing by the guides. 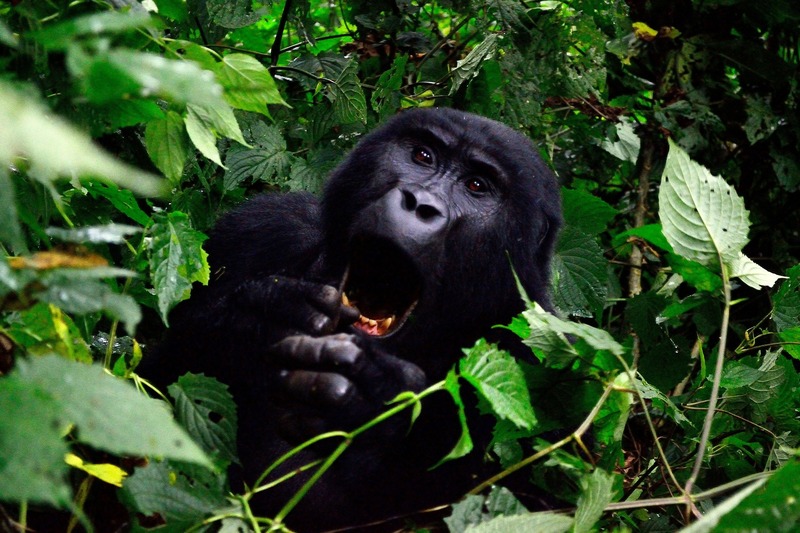 You will then set off for your Gorilla tracking activity in the forests of Bwindi. 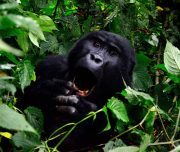 Gorilla tracking can be strenuous, you will need to carry packed lunch, drinking water, wear comfortable boots or jungle shoes suitable for steep muddy slopes, put on ear plugs for those who feel uncomfortable with jungle sounds and take a rain jacket. Walking sticks will be made available for those that require one by the park rangers. Dinner and overnight at Lake Kitandara luxury camp/Buhoma community bandas. Full board meals. This is the last day of this Uganda Gorilla Safari. After an early breakfast at the safari lodge, we depart for Kampala. Lunch enroute. We reaching Kampala in the evening where you will be dropped off at your hotel or at the airport.